Portland Oregon has been on my bucket list for some time now, and timing never seemed to work out with my wedding photography schedule. I was getting married in mid September and actually had a Monday through Friday off two weeks prior, so decided to book a plane and head out there. My only real plans were to do get some good food, check out a couple breweries, meet some cool people, do some hiking, and mountain biking over in Bend Oregon, because there's some world famous tracks over there (smart idea right before my wedding). I stayed in Portland during my 5 days there, but managed to venture all over the place. Here's a couple photos from my travels in Oregon, hope you enjoy! Saturday I had a full day photographing a wedding back in New York that ended around midnight, then Sunday I had a 7am flight out of Newark. I managed to get zero hours of sleep and was totally shot when I arrived in Portland and couldn't check in to where I was staying until 4pm (about 5 hours to kill). I decided sleep wasn't meant to be and I should get some hiking in while I was here. I was pretty close to Multnomah Falls and even though it's a very touristy place to visit, I always wanted to check it out. So here's a couple shots from over there. 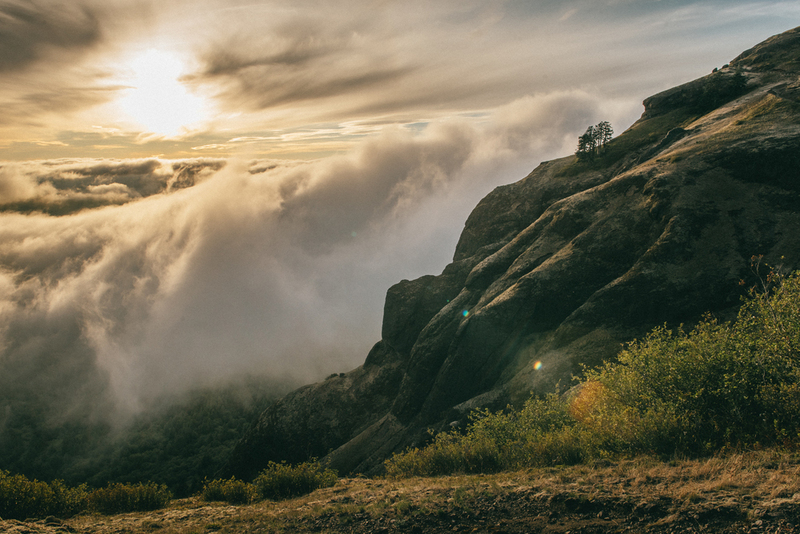 The next day I met up with some local photographers who were going on a sunset hike to the top of Saddle Mountain. It was a decent drive from Portland, but not too far. We ended up hiking pretty quick until we got to a fairly iconic spot and took a breather and some photos there, the sun was setting and all of a sudden we were engulfed by clouds. After taking all of this in, we decided to hike the rest of the mountain before it was pitch black. We made it to the top and ended up seeing the final moments of sunset above the clouds, I've only seen this once before while over in Guatemala and its such an amazing site. After that we started are hike down the mountain in the dark. We stopped halfway down to get some night shots in, the sky was illuminated with millions of stars! This was one of my favorite adventures I've been on in some time, and was glad to share it with some new friends. I didn't bring my camera along the day I went mountain biking, because I figured I would most fall at some point (I did). The day after biking I decided to check out Cannon Beach and the Oregon Coast. It was about 2 hours from Portland but a really scenic drive, it also didn't hurt that the rental car company upgraded me to a new mustang. I ended up calling a good family friend I haven't seen in years and we did some hiking together along some of the trails by Cannon Beach. Here's a couple photos from over there along with one random photo of Mount Hood I took from the car.